With the iPad launch officially restarting the tablet wars, it’s only a matter of time until all large manufacturers join the battle. Samsung are said to already be working on their own slate, which should hit the shelves in August. 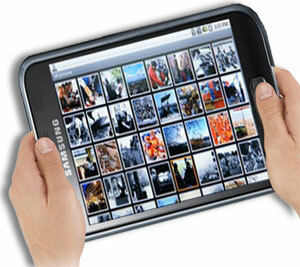 Rumor has it that it will be called Samsung S-pad and will run on the Android OS. The Korean company is going to use one of their strongest weapons, equipping the S-pad with a 7” Super AMOLED display (of yet unknown resolution). The Super AMOLED screens are currently the supreme rulers of the display realm, bettering competitors’ offers in each and every aspect – contrast, viewing angles, sunlight legibility and even brightness. The source also claims that Samsung will follow Apple in creating an application store (yay!) for their tablet and equipping it with a custom USB plug (boo!). There will also be an e-books application, but that’s as far as the machine-translated rumors get us. Note: The image used is only a mock-up and doesn’t represent an actual product.